It takes time for academics to take a position on most issues. But this joint statement on behalf of the Washington Institute for Near East Policy - the United States' top pro-Israel think tank - doesn't look good for mainstream Jewish support of Barack Hussein Obama's Iranian nuclear sellout. Most of the names on the statement will sound familiar to anyone who reads academic material on Israel. Robert Satloff, Dennis Ross, James Jeffrey, Patrick Clawson, David Makovsky, Michael Eisenstadt, and Simon Henderson. Ross, as you might recall, was in charge of the Iran portfolio during the first term of the Obama administration. They haven't made up their minds yet, but they raise some pretty serious issues. Monitoring and verification. The agreement meets the study group’s parameters for access to all known sites in Iran, including 24/7 access to declared sites such as Natanz and Fordow. However, we are concerned about whether it provides adequately “timely access” when it comes to undeclared sites. The 24 days allotted to potential delaying tactics by Iran before the issue is transferred for UN Security Council action would probably not permit Iran to hide or scrub sites where nuclear material is being used in illicit fashion. But it may very well make it possible to hide other types of violations, including potential violations of Iran’s commitments in terms of weapons design work, design and manufacture of nonnuclear components used in nuclear weapons, etc. We urge the administration to clarify its plans to address these important issues to ensure the integrity of the JCPOA’s monitoring and verification provisions. Possible military dimensions. Because the precise terms of the IAEA “roadmap” agreement with Iran on this issue are so vague, and because the agreement on access to the Parchin military site has yet to be made public, it is difficult to know whether it meets the terms specified in the study group statement: that IAEA inspectors have the ability "to take samples, to interview scientists and government officials, to inspect sites, and to review and copy documents as required for their investigation.” Further clarification is needed. 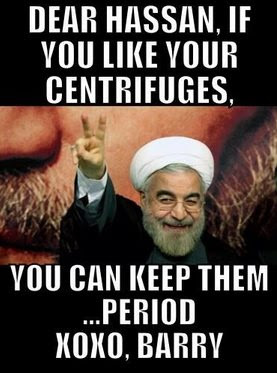 Advanced centrifuges. In the June 24 statement, the study group called for measures that "preclude the rapid technical upgrade and expansion of Iran's enrichment capacity after the initial 10-year period.” On this issue, the agreement appears to meet our standard insofar as it stipulates a cap of 300 kilograms on the stockpile of low-enriched uranium that Iran can have for 15 years. At year 10, however, limits on centrifuges begin to be removed, and at year 15, all limits are terminated. While Iran is obligated to share with the IAEA its long-term plan for research and development on centrifuges, that plan is neither public nor binding. Without knowing the content of the plan, it is difficult to judge whether this parameter has been fully met. Given that an essential element of the JCPOA is that Iran has promised “transparency” in exchange for retaining its nuclear infrastructure, we believe it is essential that Iran’s long-term R&D plan be made public soon to allow considered judgment of whether the limitations outlined in the text reflect the intent of the JCPOA. that the United States will continue to designate for nonnuclear sanctions individuals and institutions, even those on whom nuclear sanctions are being lifted, if their conduct so merits. These are important statements. Equally important is to make sure that other members of the P5+1, especially our European allies, understand the scope of continuing U.S. sanctions, so that tensions with our allies do not substitute for pressure on Iran. The administration should publicly clarify U.S. policy on this issue and ensure that our allies have a common understanding. Consequences of violations. The agreement includes a creative mechanism to provide for the reimposition of UN sanctions in the event of Iranian noncompliance, as called for in the study group's June 24 statement. But this relates to significant violations of the agreement. The snapback function may work for significant violations, but there is concern whether it will work for lesser violations and whether the United States and its partners will risk the whole agreement in order to impose penalties for lesser violations, particularly given Iran’s statement in the agreement that it reserves the right to “cease performing its commitments . . . in whole or in part” in response to reimposition of any sanctions. To strengthen deterrence of Iran, it is also important for Israel to have its own independent deterrent capacity. To that end, we urge the Obama administration to commit to providing technology to Israel that would secure this objective over time, starting with proposing to transfer to Israel the Massive Ordinance Penetrator and the requisite aircraft, which will ensure that Israel has the ability at a later date to deter Iran from reaching a nuclear weapon. A call for the United States to affirm that it is U.S. policy to use all means necessary to prevent Iran from producing sufficient fissile material (highly enriched uranium) for a nuclear weapon – or otherwise acquiring or building one – both during the agreement and after it expires. This is a vital initiative because Iran will remain a nuclear threshold state (and will clearly have retained the option of becoming a nuclear weapon state) as restrictions on stockpiles of uranium and centrifuge production lapse gradually after 10 years and, along with the ban on reprocessing, end after 15 years, and the question is raised about what would deter Iran from then developing a nuclear weapon. One powerful element of deterrence would be for the United States to go on record now that it is committed to using all means necessary, including military force, to prevent this. While some senior administration officials have made positive statements in this direction, such as the statement made in recent Congressional testimony by energy Secretary Moniz to the effect that development of HEU by Iran at any point in the future would be a red line that the United States should not allow, we urge the president now to formalize this as a declaration of a U.S. policy and Congress should formally endorse it. Separate from the agreement, the study group called on the president to articulate a “resolute regional strategy” to counter Iranian negative behavior throughout the Middle East. We believe the articulation and implementation of this enhanced effort to counter Iranian negative behavior—and to support allies and partners—in the region is both important and urgent, given the substantial financial benefits Iran will receive early in the implementation of this agreement and the likelihood that considerable sums will be directed toward Iran’s destabilizing regional activities. Working with our allies, we urge the administration to build on the president’s GCC Summit and discussions of Secretaries Carter and Kerry and adopt a number of tangible steps as soon as possible. I have to wonder about the usefulness of "a declaration of US policy" endorsed by Congress that says that the US will take military action against Iran to stop it from developing a nuclear weapon. We've been down that road before. All in all, however, the academics display a healthy skepticism over the Obama administration's nuclear sellout to Iran. Whether that translates into opposition remains to be seen, but the administration's touting the report as backing its position seems clearly premature.